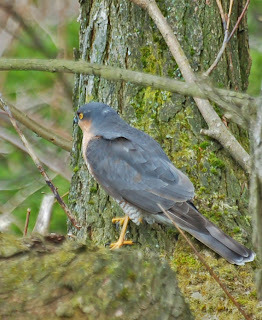 Had an excellent view of a male sparrowhawk at Low Barns today. It may be the end of March but it's still winter. We went for a walk around the old railway lines. Hazel catkins are out on the bushes. 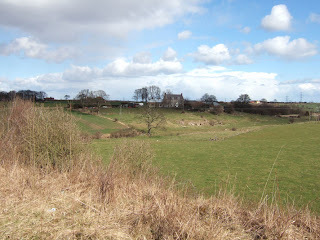 One moment the sun was shining and Pesspool Hall Farm was bathed in sunshine. Five minutes later we were being battered by horizontal hail storms in a freezing wind. 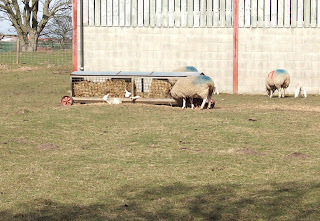 The newborn lambs were taking advantage of the shelter of the feeding trough. Heard a curlew calling as it flew over the house yesterday. Signs of Spring!